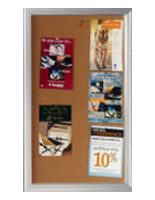 Snap Frames : This snap frame is an enclosed bulletin board! This enclosed bulletin board is ideal in schools and universities. 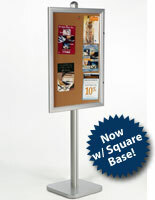 It is also popular in hotel & bank lobbies, business offices and in restaurants. 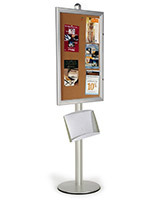 This floorstanding display, the enclosed bulletin board features a cork board display surface and a lock. This combination gives you a unique, easily changed and tamper proof display board. The display surface is cork. The weighted base, pole and frame are constructed from brushed aluminum. 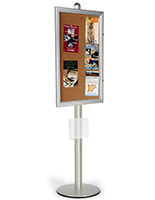 Secure your flyers, announcements and other messages on the board with thumb tacks or push pins. 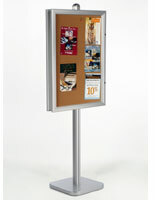 The enclosed bulletin board, such as the floorstanding corkboard, has a weighted base for stability. The cork board is a bulletin board with an adjustable height. Easily change the height of the cork board utilizing the groove in the pole and a connector. Initial assembly consists of attaching the base to the pole and the corkboard to the pole. 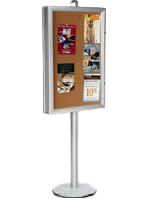 We provide the bulletin board with the necessary installation hardware, push pins and 2 keys.